ely easy to use for sharing messages, photos and more, but a child may have difficulty understanding the complexity of Google Buzz's privacy settings. Here's a brief explanation of how one blogger found that out the hard way, and what you can do to keep your child's online life safer. re using Google Buzz. Li's daughter had sent out an innocuous message via Buzz, but it came as a shock to Li since she didn't realize her daughter was even using Google's new social media tool. Of even more concern for Li was the fact that the sharing control for that message had been set to public, meaning anyone who was following her daughter, or could find her Google profile, would see it. After further investigation, Li discovered that many of her daughter's friends were also sharing messages with the public, and had even started revealing personal details, such as their e-mail addresses, with complete strangers. Li also found that some less than desirable Google Buzz accounts, such as 'iorgyinbathrooms,' were included among her daughter's Buzz followers. Now, it should be pointed out that, officially, Google does not allow anyone under the age of 13 to own a Gmail address. However, as Li points out, the age requirement is easily bypassed since Google doesn't even ask for your age when your sign up for Gmail. Li believes it's time for Google to institute some proper parental controls into Gmail. Microsoft has an Internet safety suite called Family Essentials that you can use to filter and monitor your child's online activity. tacts lists to decide who your children can communicate with on Windows Live Spaces, Hotmail, and Messenger. The software can also provide detailed activity reports of your child's online activities. Family Essentials must be installed on every computer your child uses, but you can adjust the privacy and restriction settings online. Family Safety requires Windows XP, Vista, or Windows 7 -- you can find a complete list of system requirements on Windows Live. 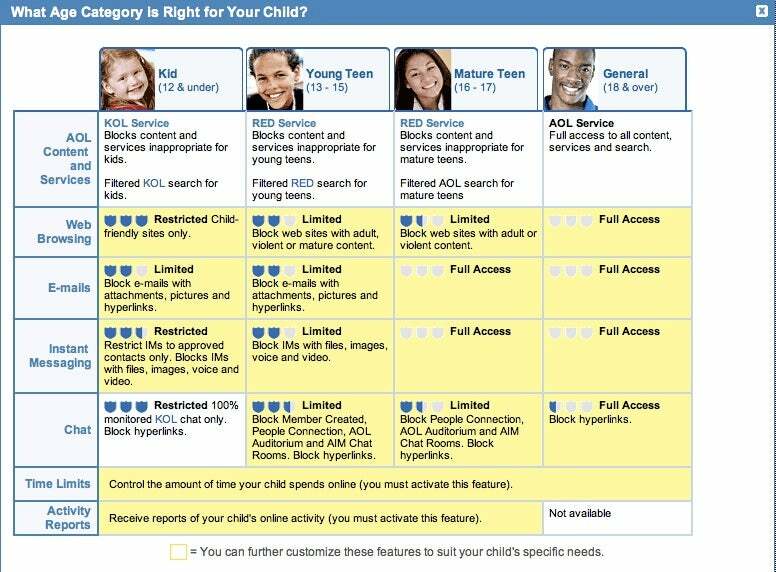 AOL has a variety of preset parental controls through its KOL service, with age-specific restrictions for kids 12 and under, 13-15, and 16-17. You can also set time limits for online access, and get reports on your child's online activities. For AOL's services you have to download Parental Controls software (Windows Only) for Internet Explorer or Firefox, and at time of sign up you will need to provide a credit card for age verification purposes. specific contacts only; filter e-mail messages with coarse language; remove attachments from incoming mail; and blacklist senders. Zoo-buh even has something called Mail Queue, which allows you to approve all incoming messages for your child's account before they receive it. Zoo-buh costs $30 per year for each e-mail account. and Import.' Under 'Send mail as' click 'Send mail from another address' and fill out the pop-up window with your child's name and your child's Gmail address. Google will then send a verification ID to your child's account; once you've verified the e-mail address your child will be able to send e-mail from her or his Gmail account right from your inbox. Next go into your child's Gmail settings, click on 'Forwarding and POP/IMAP' and select 'Forward a copy of incoming mail to' and enter your own Gmail address. You can also choose whether you want to keep a copy of all Gmail messages in that inbox or delete them once they've been forwarded. Now, your child can send and receive e-mail from your inbox, and you'll see everything that's coming into their account. You can also set up a filter for incoming messages from your child's Gmail address, so your child can see all messages in one spot. One word of warning with this set-up, though: make sure that when your children send e-mail, the child's Gmail account is selected as the "From" account in the compose message window. Otherwise, they may end up sending messages to their friends under your name. Of course, another alternative is to disable Google Buzz on your child's account by clicking on "Settings" and then "Buzz" and selecting "Disable Google Buzz." This will remove your child's Google profile, Buzz posts, and Buzz followers, and also remove any sites connected to the Google profile such as Facebook and MySpace profiles.